Although the HR departments are looking beyond the basic, transactional processes which are increasingly becoming automated, the use of advanced technology is still in a nascent stage. Six out of ten companies are expanding their HR technology budgets, according to the People Matters Technology Study. Even as HR departments look beyond the basic, transactional processes that are increasingly being automated, the use advanced technology is still in a nascent stage. 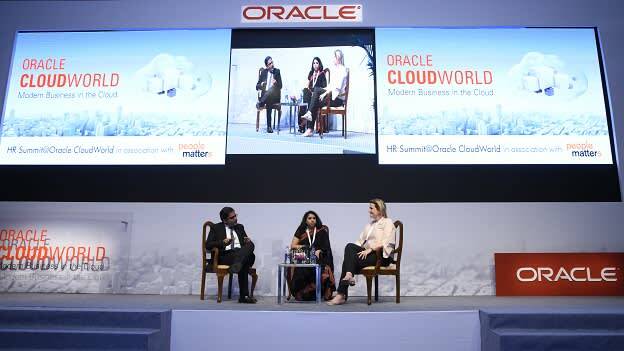 To reflect on the advances and challenges, Oracle in association with People Matters organized the “HR Summit@Oracle CloudWorld” in Mumbai on April 7th, 2016. Inaugurating the India edition of the CloudWorld conference, the Chief Minister of Maharashtra, Devendra Fadnavis spoke about the opportunity that cloud computing provides in changing the landscape of governance, by enabling “efficiency, transparency and inclusivity”, all of which are central to driving innovation. The HR summit kicked off with an opening keynote by Anne-Marie O’Donnell, Senior Vice President, EMEA and APAC, Oracle. It was followed by an insightful presentation on the upcoming ‘Global Human Capital Trends Study’ by Dheeraj Sharma, Director of Human Capital and HR Transformation, Deloitte. Highlights of the one-day conference also included case studies of leading companies that have transformed their HR processes using advanced technologies and a high-level CHRO panel moderated by Ester Martinez, CEO and Editor-in-Chief, People Matters that reflected on tech agendas for the upcoming year. ...And the winner is the candidate, whilst the robots are coming soon. The much-touted war for talent is over. While HR departments continue to tackle talent scarcity by enhancing their value proposition and employer brand – the choice of an employer is more firmly in the hand of the candidate, who is more often than not a millennial. “In order to tap the right talent, companies must plan not just to attract the right talent, they should also plan for future attrition, offers rejected and assess the skills needs of the future,” says Anne-Marie O’Donnell, Vice-President, Recruitment, EMEA, and APAC. While attracting niche talent is a problem on one end of the spectrum, on the other end is rising automation. Whether it has to do with organizational design or identifying high potentials, teams will be central to how work is organized and executed. According to Dheeraj Sharma, Director of Human Capital and HR transformation at Deloitte, the number one priority for most organizations that participated in Deloitte’s Global Human Capital Trends Survey is organizational design. While most organizations are still hierarchical in nature – whereby job roles and experience are correlated, the future of organizational design will depend on ‘networked teams’ – where expert teams will interact with each other to execute work. According to Indira, SVP – Human Resources of Genpact, in order to identify high potentials for the organization, team pools are an efficient method of building the talent pipeline. Often, the approach to developing leaders has meant matching individuals on a one-to-one basis. This approach has proven faulty due to a variety of factors including – changed interest of the candidate, changed role/skill that the position required etc., So, identifying a pool of excelling candidates helps the company be more fluid in its approach to building a talent pipeline. Data quality is vital for organizations that are considering taking the ‘people analytics’ leap. While advanced human capital technologies are capable of generating a wealth of reports including those that business leaders can use, the utility of these reports depend upon the quality of the data that the organization maintains. “Data quality is a top priority for us,” says Beatrice, Digital HR Transformation Head, Schneider Electric. “It is critical while using a tool like Oracle Taleo” she added. It’s time for HR to understand the operational aspects of technology implementation. Suruchi Maitra of Unitedlex, a legal advisory firm noted that it is time for them to focus on how to make the most for their own context. This step also requires HR departments to have conversations on how advanced analytics can help them deliver better employee experience, have a talent-centric view of any issue, support policies and regulations and streamline functions within the function. “Execution discipline is critical to driving transformational value and change,” noted Makarand Khatavkar, Group Head HR, Kotak Mahindra Bank. Anand Rao, VP & Group Head – HR, Polycab Wires pointed out that when organizations are looking at customization of critical issues, “they need to focus on building the right team and they need to choose people champions” as a means of encouraging technology adoption. Going social doesn’t just apply to the brand; it applies to your business leaders as well. “In order to help your leadership succeed, make sure you enable them with the right tools and support them as and when required,” says O’Donnell. Companies are turning to one-to-one reverse mentoring programs and are mapping young employees to the leadership team. In the face of ruthless technological disruption, where it seems that leaders have to keep up with a host of new technologies, utilizing the potential of your high performing millennials will go a long way in driving your brand presence online. Keeping pace with disruptive technology has been a major problem today; it is also a concern that was raised by participants in the conference. TK Srirang, HR Head, ICICI Bank noted that “while the future is uncertain, the cost of not taking advantage of technology solutions today will be much higher than taking steps to adapt to available technology”, it is easier to build on technological advances, rather than wait indefinitely for a revolution to occur. For more information about Oracle CloudWorld, click here.